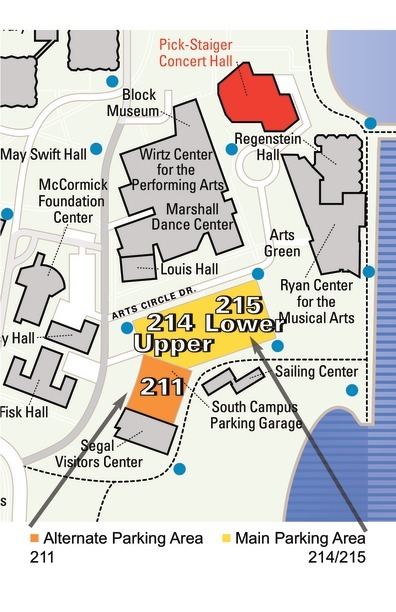 Pick-Staiger is located in the Arts Circle on the Evanston campus of Northwestern University. The main lobby entrance for concerts is on the west side of the building (revolving and regular doors). You can drive all the way up to the entrance to drop people off. Free parking is available in the parking structure just south of Pick-Staiger. Wheelchair accessible parking is in the same lot. Both levels of the parking garage are open, with exits at the east and west ends. If you park on the upper level, the eastern pedestrian exit is now on the same level as Pick Staiger. Note that a university parking permit is required in this lot until 4 p.m. on weekdays. Wheelchair accessible seats (16) are located on the ends of rows G and H.
Seats EE 15-40: Obstructed View for Individuals Under 5'-10"
Enter your full address, including city and state. The High School Official Address is 1600 Dodge Avenue. To more accurately show the Auditorium Entrance location, an address of 1520 Dodge Avenue has been used.